Ideal for everything from slicing tomatoes and sandwiches to hulling strawberries or creating decorative garnishes, this does-it-all utility knife is a versatile addition to any kitchen. Designed by the legendary blade smiths at Global and only available at Sur La Table, the handcrafted Ni cutlery collection offers the cutting-edge performance and precision craftsmanship for which Global is famous-all with a new, innovative design that's engineered to feel like an extension of the hand. 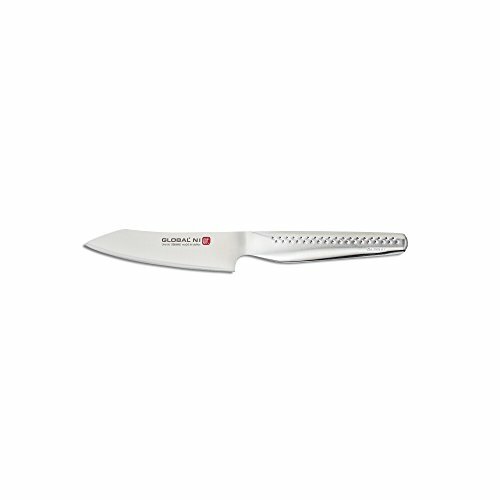 FEATURES New blade geometry designed exclusively for Sur La Table balances graceful, modern design with precision and durability for the ultimate in performance at the cutting board. Forged from a single piece of stainless steel for the ultimate in strength, durability and performance. Lightweight G18 CROMOVA steel takes and holds a lasting edge-even at the ultra-sharp 12.5A Degree angle used in Japanese cutlery. Rounded spine ensures comfort while using a professional pinch grip. Sleek, ergonomic handles are designed to maximize comfort and control and are precisely weighted for impeccable balance. Seamless design is hygienic and easy to maintain. Manufacturer: Global. Material: Stainless steel. Care: Hand wash only. Dimensions: 4.5" blade, 9" overall. Warranty: Lifetime warranty. Made in Japan.